Merapi not only gives life to men around him, but also in some animals, one bird. A total of 150 to 200 species of birds depend on Merapi to live, find food, and reproduce. Merapi activity that has lasted more than a week certainly disrupt the existing bird survival. Ign Pramana Yuda PhD, an expert on birds of Atma Jaya University, Yogyakarta, said the bird is far more vulnerable to the activity of Merapi. "During the Merapi activity, they are very scarce food because no one caring. So, they are much more suffering," said Yuda. Pramana said, not all birds are able to respond quickly Merapi disaster. He explained that similar birds raptors, like eagles, may quickly be able to fly to other regions. However, some endemic birds Merapi is still alive, but can not fly away will be greatly affected by the activity of Merapi volcano outside this usual. Further, he said the need of post-activity of Merapi to continue bird conservation program. This was necessary because the process of environmental restoration to its original state in nature may take place within a period that can not be ascertained. Human assistance is needed in this regard. "Maybe the need for habitat restoration. For example, by planting several species of trees that had been growing at Merapi," Pramana said that graduating from the School of Marine and Tropical Biology, James Cook University. 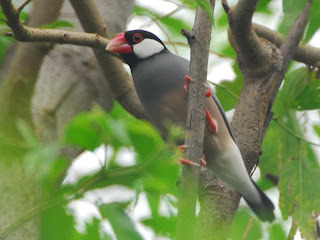 Planting trees may help restore the habitat that the birds that had also "displaced" to other areas could return to Merapi. Post-recovery environment Merapi activity plays an important role in bird breeding efforts. As known, Merapi, a habitat for several bird species are now classified as protected species. One type of protected bird species is the Javan hawk-eagle.